The Planet Waves Polypropylene Guitar Strap is made from extra heavy-duty polypropylene webbing, designed to last much longer than ordinary polypropylene straps. This 50mm guitar strap will provide reliability and comfort for many years! Designed for players of all genres, Planet Waves Polypropylene straps offer designs that will please even the most discerning player. 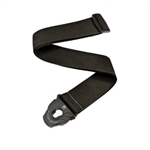 These durable straps are sure to accent any guitar, are a great value, and are adjustable from 35 to 59.5 inches long. Safe, secure, and easy to use. Thanks to the patented design Planet Lock system, this 2" polypropylene guitar strap fits virtually any guitar and stays locked in place until you release the side pin. Unlike ordinary strap lock systems, Planet Lock is designed to fit securely on your guitar's existing end pins, so there is no need to change the hardware on your guitar. Plus, you can easily swap out the guitar strap to different guitars. 2½" suede guitar strap with suede backing. Adjustable from 38" to 53"
The Neotech Slimline strap with Slimlock connection is a comfortable and very secure guitar strap choice. The revolutionary Slimlock attachment system secures tightly without the bulk and rigidity of a conventional connector. A steel cam lock attaches around the guitar pin while the two-part leather construction envelopes and secures the system with a touch closure. This unique attachment system forms an extremely secure, yet flexible nonmarring connector that can be quickly removed.